Fashion week has begun! It's technically not the first day, but because of school, it is for me! I didn't really tell you all but I actually applied to some shows this season - surprise! - so I will hopefully have some things to share over the next few days. I had to turn down an invite to a show on Friday (major disadvantage of being a teen blogger: school has to come before fashion week). If I was in charge, school would be optional during this period of time (and that's probably why I'm not in charge). SO. 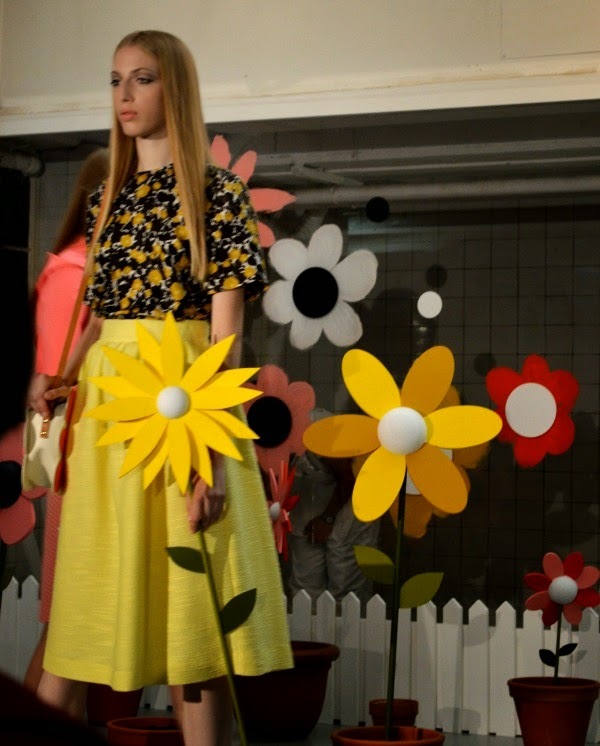 Today I got up bright and early and headed to Soho to see the Orla Kiely presentation. It was amazing. I think one of the great things about choosing to do a presentation instead of a catwalk is the fact you can be so creative with it, and really use it to empathize with the style of your brand. The show began with Alia Penner and other girls dressed in white painting flower petals around circles on a glass screen. Then the models paraded through, each carrying a flower which they placed in one of the empty pots. The clothes were stunning. 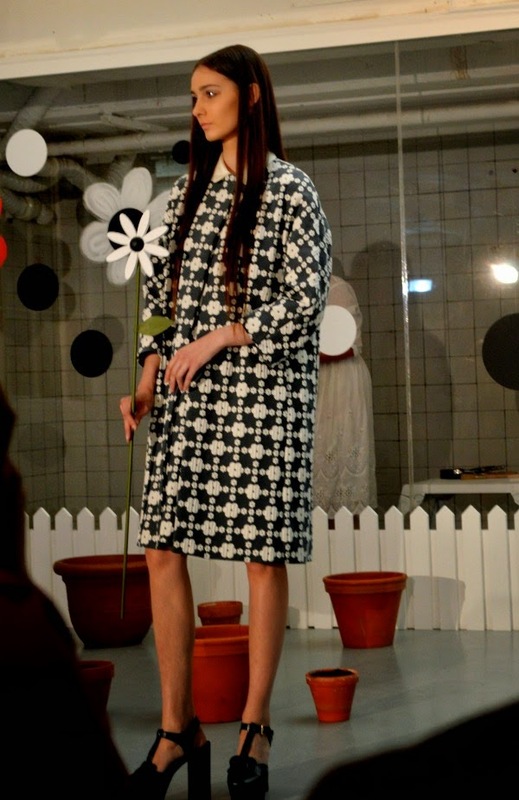 They had the classic Orla Kiely quirky prints with new shapes and silhouettes. Here are some snaps of my favourites. The painting was a great feature, and it really brought the show to life. 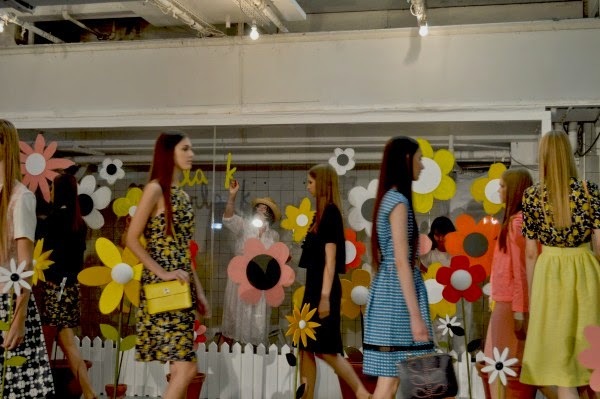 As it progressed, the room slowly filled up with flowers and as the models did their final walk, Orla Kiely was painted onto the glass. 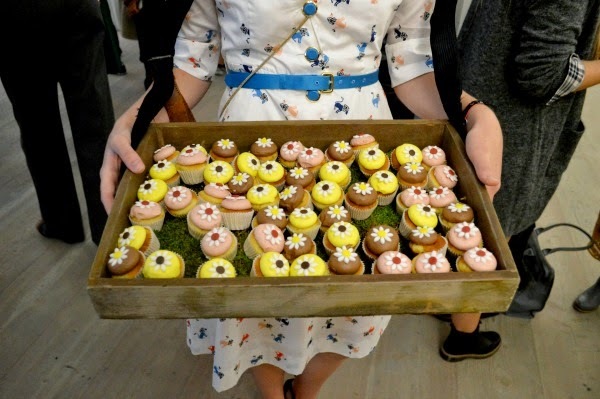 Even these adorable flower cupcakes were handed round! The presentation was so fantastic and I even bumped into the lovely Ellie and it was so nice to meet her after reading her blog for such a long time. And here is what I wore for day 1. As you know from this post, I am currently obsessed with the '60s so I had to wear my new mod shift dress. I paired it with some awesome fishnet tights, ankle boots and some winged liner to complete the look. Ohh and my amazing silver ponytail cuff was a gift and definitely contributed to the '60s vibes. After Orla Kiely, I wandered round Carnaby street with my amazing Mum who has decided to be my accomplice in all this (she gets to shop and I get a lift to events it's a fab deal). I drooled over some gorgeous shoes in Office and even did a little survey thing. I then unfortunately had to head back home, despite my complaints, to help out with a school commitment. Overall, it was a short but very successful day and I'm hoping tomorrow will be good too. Thank you, yes it was amazing! I loved the presentation. Everything was so colorful and bursting with life. Seems like it could be more fun than going to a catwalk. If only I lived in a place where they hosted fashion week. But even then I could never get out of school to go watch anything.